We REALLY need your help! With only one month left of 2008, we still have 500 copies of our 2009 Dreams for Women Calendars left to sell! The money raised by selling these calendars is instrumental for us to launch Antigone For Girls (a magazine written by and for girls aged 10-15 that will encourage them to get involved in leadership and politics). The 2009 Dreams for Women Calendar is a non-profit calendar featuring 12 postcards sent in from around the world depicting men and women's Dreams for Women (Ex. 'I dream of a world where no woman is seen and not heard'). The funds raised from the sales of the calendar go to the Antigone Foundation (www.antigonemagazine.wordpress.com). Please forward this e-mail on and let everyone know what a great project, organization and calendar this is. Buy copies of the calendar for yourself or as holiday gifts for family and friends. Or buy one for a special woman in your life who has helped YOU make your dreams come true! This is a great opportunity to buy a cool feminist gift for the holidays and to support a great organization! See below for more information about the Dreams for Women project and calendar! Antigone Magazine's Dreams for Women postcard art project is launching it's 2009 Dreams for Women calendar featuring postcards submitted by men and women around the world! The calendar seeks to help raise money for The Antigone Foundation and to provide a way other women's organizations around the world can also fundraise for their own organizations. As part of this launch, we have created a video in which men and women share their dreams for women equality. Featured in Ms. Magazine, in the International Women’s Museum, and on Feministing.com, the postcard art project has attracted worldwide attention and interest, garnering media attention and submissions from as far away as Japan, Germany, Brazil, France, Portugal, Romania and Los Angeles. The Dreams for Women art project asks women and men of all ages to depict their hopes and dreams for women (examples include “I dream of a world with more female leaders” and “I dream of a world where no woman is seen and not heard”) by painting, drawing, writing,sketching or decoupaging them onto a postcard. 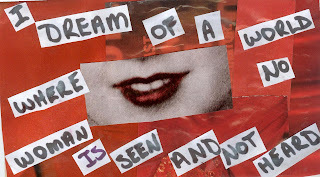 Inspired by the popular mail-art project PostSecret.com, a postcard art project that encourages people to send in their secrets, Dreams for Women strives to be a feminist PostSecret. Instead of asking what your secrets are, the project wants to know what your dreams for women are.The Antigone Foundation began receiving submissions in January 2008 and has received hundreds of submissions so far. Their YouTube videos,which showcase the project, have also received thousands of hits. The project was started out of a desire to encourage women and men to envision a better future for women and to help fund work towards that future. Dreams for Women has thus launched a fundraising calendar. The calendar,featuring 12 postcard submissions from around the world, will be sold for $20 and is available via Antigone Magazine’s blog www.antigonemagazine.wordpress.com. Indeed,the project hopes to raise money to officially launch the Antigone Foundation, a non-profit, non-partisan organization that will encourage young women to get involved in leadership, politics and activism. The organization will continue the work started by Antigone Magazine, a publication about women, politics, leadership and activism that started at UBC and has since expanded to a national subscription base, as well as, to the University of Toronto.